The slim designed fire fighting light bars features plenty of high intensity LEDs that can be used as brake lights, turn signals, or even intensified exterior lighting. The rod was created for exterior use and is made to fit between the bed of the truck and the rear bumper. The rod is constructed with waterproof casing and is supplied with rust proof stainless steel screws to ensure a long life and a lasting appearance. 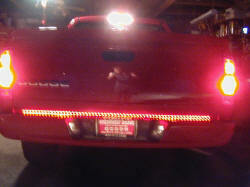 This line of fire not only gives your truck that custom look but now when you press the brakes ... everyone notices you! - Available in 60" and 49"
No one can miss you! Extra lighting for extra safety! Acts as a running light, lights up when you brake, left side flashes with left turn signal, right side flashes with right turn signal. Effortless, no-drill hookup! Nothing is easier! Simply plug the connector into truck's standard 4-pin flat trailer light connector. If truck does not have this connector, cut off the connector on the cable and hardwire the leads to the taillights. If you love your new lights and need something to mount them to ... then check out CARR's new cab mounted light bar. Wide cast aluminum mounting base. Available in either XM3 polished aluminum or XP3 black powder-coat finishes. XM3 bars feature a stainless steel cross bar. XP3 bars feature a black powder coated stainless cross bar. All CARR light bars come with special bolts that are keyed to protect your investment. Designed to securely mount to the roof gutter. They can be mounted to most vehicles with internal gutters by using the stainless steel gutter mount kit. Carr light bars hold up to 5 auxiliary lights and available in either the Deluxe standard fixed position or as a Deluxe rota version, where the lights and mounting bar fold down for clearance. It is aluminum construction, which means no maintenance and no rust. If a cab mounted light bar is not what you were Thinking about then you may be interested in the Westin light bar. It mounts to the front of your truck or SUV. Built for compact and midsize trucks and SUV's, Westin's Safari Light Bar adds extra front end protection, a sweet rugged look and a secure mounting point for auxiliary driving lights. All at an amazing half cost of most full-size grille guards. With a look that isn't overpowering, your vehicles outstanding looks will still shine through. The Safari Bar is made from 2" heavy-duty steel tubing with slotted 1" x 0.5" hole tabs that accommodate a wide variety of auxiliary lights. So if you want a sweet new custom look, plus extra safety features, then a fire fighting light bar is for you.